At MiaDeRoca we love February, in parts that has some very personal reasons, but we love February for being so marvelously different. February is gorgeously compact with 28 days – all together 4 weeks, and the March afterwards can be very easily planned. Because, if February the first is a Tuesday, March first will be Tuesday as well – ain't that handy. That every now and then February grows to have 29 days, fits very well to this individual month within the dozen of months that form a year. Tremendously great about about February is the middle of the month – the 14th of February, the day of Saint Valentine - Valentine's Day. The tradition started several centuries ago in England and since then it has been development and changed. The one which is paradigm to all traditions is that lovers give each other a token of appreciation on the 14th of February. In German countries this little something is usually flowers, chocolate and other sweet and cute things. The 14th of February is a day in the middle of the ending winter – melting snow, brown puddles and ponds, soaked lawns and big piles of loose chippings – and it is great splash of light. As carneval (Austrian Fasching) ist approaching and Christmas is definitely gone your home needs some colour therapy in February. Especially at this time of year I love garlands, buntings and chains for decorations. You can arrange them around lamp shades, put it on the book shelves, stick them on the wall or at the door. A swinging splash of colour – you can apply the garlands quickly and put them away if you want them to arrange them again in your living room or bedroom. As you can hear I do prefer textile garlands over paper ones. Inspired by several wedding receptions last year, the MiaDeRoca team developed a pattern for a two-coloured crochet heart – a step by step tutorial with lots of photos for the crochet heart "Maria" is available in our shop. Line up some of this sweet hearts and you have your very own and unique, selfmade heart garland. You can use this heart chain to decorate a wrapped gift and give it a romantic touch. We adore the cute crochet hearts and use them as name tags, place cards and table decorations – and we are sure that our creative customers have many more ideas what to use their heart crochet decorations for. All, that visit our MiaDeRoca Facebook page learn what to do to receive a crochet heart for every order until the end of February. 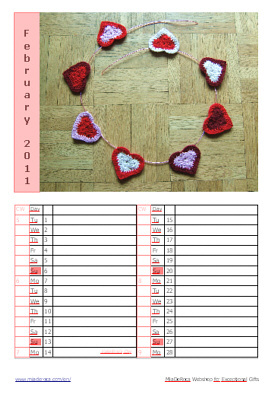 And, who knows, maybe some start on February 14th to produce their own crochet heart garlands for their wedding. Most might have guessed by now, that the photo on our February calendar sheet is all hearts and love with a heart garland in romantic colours red, dark red, white and pink.